Yale astronomers have taken a fresh look at the nearby Alpha Centauri star system. Credit: Michael S. Helfenbein. Yale astronomers have taken a fresh look at the nearby Alpha Centauri star system and found new ways to narrow the search for habitable planets there. According to a study led by Professor Debra Fischer and graduate student Lily Zhao, there may be small, Earth-like planets in Alpha Centauri that have been overlooked. Meanwhile, the study ruled out the existence of a number of larger planets in the system that had popped up in previous models. "The universe has told us the most common types of planets are small planets, and our study shows these are exactly the ones that are most likely to be orbiting Alpha Centauri A and B," said Fischer, a leading expert on exoplanets who has devoted decades of research to the search for an Earth analog. The new study appears in the Astronomical Journal. Co-authors are John Brewer and Matt Giguere of Yale and Bárbara Rojas-Ayala of Universidad Andrés Bello in Chile. The Alpha Centauri system is located 1.3 parsecs (24.9 trillion miles) from Earth, making it our closest neighboring system. It has three stars: Centauri A, Centauri B, and Proxima Centauri. Last year, the discovery of an Earth-like planet orbiting Proxima Centauri set off a new wave of scientific and public interest in the system. "Because Alpha Centauri is so close, it is our first stop outside our solar system," Fischer said. "There's almost certain to be small, rocky planets around Alpha Centauri A and B." The findings are based on data coming in from a new wave of more advanced spectrographic instruments at observatories located in Chile: CHIRON, a spectrograph built by Fischer's team; HARPS, built by a team from Geneva; and UVES, part of the Very Large Telescope Array. "The precision of our instruments hasn't been good enough, until now," Fischer said. The researchers set up a grid system for the Alpha Centauri system and asked, based on the spectrographic analysis, "If there was a small, rocky planet in the habitable zone, would we have been able to detect it?" Often, the answer came back: "No." 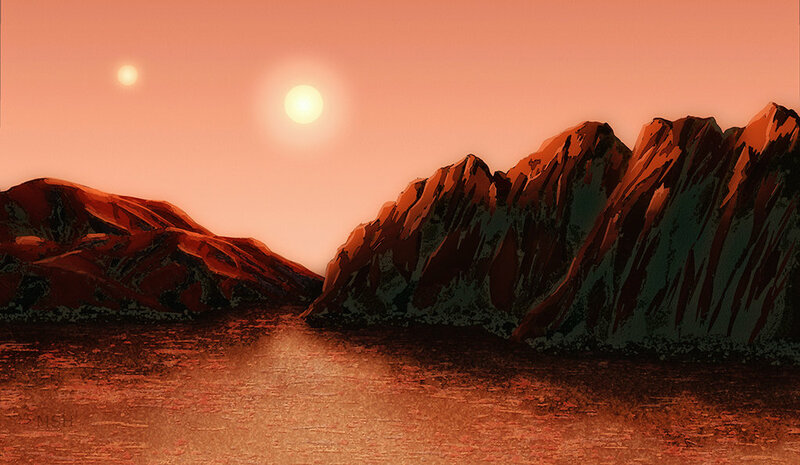 Zhao, the study's first author, determined that for Alpha Centauri A, there might still be orbiting planets that are smaller than 50 Earth masses. For Alpha Centauri B there might be orbiting planets than are smaller than 8 Earth masses; for Proxima Centauri, there might be orbiting planets that are less than one-half of Earth's mass. In addition, the study eliminated the possibility of a number of larger planets. Zhao said this takes away the possibility of Jupiter-sized planets causing asteroids that might hit or change the orbits of smaller, Earth-like planets. "This is a very green study in that it recycles existing data to draw new conclusions," said Zhao. "By using the data in a different way, we are able to rule out large planets that could endanger small, habitable worlds and narrow down the search area for future investigations. "This new information will help astronomers prioritize their efforts to detect additional planets in the system, the researchers said. Likewise, the continuing effort by Fischer and others to improve spectrographic technology will help identify and understand the composition of exoplanets.